After a wildlife biologist ignited hay spread across a tilted, grated metal slab outside a lab in south Rapid City on Thursday, the fire traveled uphill along the table, eventually lighting the grassy top of a large soil sample. Inside the cylinder-shaped core sample were two sensors — wrapped in the same material that wildlife fire shelters are made of — recording the soil temperature every tenth of a second. Once the fire died, nearly all of the hay was gone, and the plants and top of the soil were burnt and blackened. “We try to mimic fire to the best we can in the lab,” Jackie Ott, an ecologist at the Rocky Mountain Research Station, said after monitoring the experiment, garden hose in hand. The station, part of the U.S. Forest Service, is located next to the Black Hills National Forest building on Mount Rushmore Road. 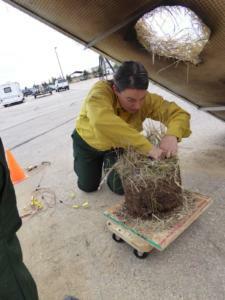 The core sample experiments are just one part of a three-year, multi-agency research project into how the grass and shrublands of western South Dakota and eastern Wyoming respond to wildfires. It also involves field experiments that ignite and record data from 20 small plots of land spread throughout the Buffalo Gap National Grassland, a nearly 600,000-acre protected area in South Dakota. Field experiments will also take place at 16 sites on private and public land in Wyoming. The core samples are taken, and the field sites are located in different areas so the researchers can learn how various factors — plant type, the amount of invasive species, soil composition, weather — affect how grasslands regrow after fires. “We need good science done on how do plants grow back after fire. It’s a concern for (cattle) producers, it’s a concern for wildlife firefighters, it’s a concern just for the American public,” said Ott, one of the six scientists spearheading the project. “What’s unique about this is usually with a lot of fire studies you can only look at what happened after fire,” but this one involves pre-fire data, she added. “I’m hoping that land managers and private landowners can learn how the plants respond to different types of fire and basically use that information to make more informed decisions about what to do with the land when different types of fire occur,” said Brian Dickerson, a wildlife biologist who coordinates and works on the field experiments. Ott said three main groups will benefit from this research: wildland firefighters, ranchers and scientists. Scientists, Ott said, will gain baseline data that will allow them to explore new questions and research projects. She said there isn’t much research in this region since there aren’t many major research universities in the area. The project began in September 2017 and is mostly funded through the Joint Fire Science Program, a federal organization that provides money for research on wildland fires. So far, Ott said, the experiment has involved selecting and mapping the field sites, gathering nearly 300 core samples (weighing about four tons) to bring back to lab, and documenting which species are in the soil. The scientists will now begin analyzing the data collected during the fall field studies last week before returning in the spring to see how the grass has regrown and ignite the plots again. After the project is completed in December 2020, the researchers will present their findings in scientific papers, at research conferences, in an online webinar and during two field-based presentations open to the public.